Media deserts are geographic locations where local news is difficult to find. This may be caused by the reduction in newspaper staffs or the closing of local publications. For example, did you know that the Denver Post is owned by Digital First Media, the largest privately-owned newspaper chain by circulation? When cities begin to lose their newspapers to financial powerhouses, how can those communities stay informed on local news? Essentially, how can communities compete with these emerging threats in news desert? Knowing the makers of the news media such as reporters and journalists is a crucial step in fighting these threats to free press. While many local news platforms throughout the country are owned by investment and private corporations, cities like Denver are thriving with non-profit and independent media organizations providing a fresh and local perspective on news that is important for the city’s residents. PEN America hosted a Media Huddle on March 21st at 2:00 PM with Open Media to meet the people behind the news in Denver. Moderator Tony Shawcross, Executive Director of Open Media Foundation, introduced the influential local newspaper and news editors to describe their processes and criteria for quality journalism and reporting. Panel members for this event included Maeve Conran (News Director at KGNU), Gabrielle Bryant (President of The Colorado Association of Black Journalists), Bruce Finley (long-time reporter with the Denver Post), and Jon Murray (city hall reporter with the Denver Post). There was also a Question and Answer session to conclude the panel discussion for news consumers to learn more about the resources and media platforms available to the community. PEN America invited questions in person or through email for those that could not attend. This discussion was broadcast live through Open Media’s local cable channel. Gabrielle Bryant is an Emmy Award-winning producer, freelance journalist and owner of Gabby’s World Media, a Denver-based media firm. She’s best known for her work as producer of Colorado Inside Out, a public affairs program that recently celebrated 25 years on air. She’s also the creator of The New Black Experience, an interview series highlighting accomplishments of African American millennials thriving in arts, philanthropy, tech and business. When she isn’t reporting on Colorado politics, serving as president of the Colorado Association of Black Journalists or PR co-chair of CultureHaus, her main gig is motherhood. Bryant has two daughters ages 12 and 8, which she deems as her best job yet. Maeve Conran is the News Director at KGNU, a community radio station in Boulder and Denver. Originally from Ireland, Conran’s news stories have been broadcast on BBC, Radio France, RTE as well as NPR and many radio stations in the US. Her work has been recognized regionally by the Colorado Broadcasters Association and nationally by the Public Radio News Directors Inc. She is the co-host of the monthly radio book club, a collaboration between KGNU and the Boulder Bookstore featuring in depth conversations with authors. Bruce Finley covers environment-related news: the land, air and water issues around Colorado and the West. A longtime Post staff reporter who has worked worldwide and a lawyer, Bruce grew up in Colorado and its mountains and has relished the chance to serve residents. Bruce graduated from Stanford University, then earned masters’ degrees in international relations as a Fulbright scholar in Britain and in journalism at Northwestern University. He went to law school at the University of Denver, earning his JD in 2012 and joining the Colorado Bar. He has won numerous journalism awards. His international affairs work led to on-site reporting in 40 countries including a stint in Africa, multiple assignments in Iraq, and after the 9/11 attacks, around the Arab world from Pakistan to Yemen. Jon Murray is The Denver Post’s city hall reporter. His political and government coverage focuses on Mayor Michael Hancock, the City Council and the impact of policy decisions on Denver’s people, from neighborhood issues to marijuana industry regulation. A Colorado native, he joined The Denver Post in 2014 after a decade spent reporting for The Indianapolis Star. Panel moderator Tony Shawcross developed and launched the Open Media Foundation, a visionary nonprofit communications firm based in Denver, CO, where he has helped hundreds of nonprofit and public sector organizations convey their message through effective media and trained thousands of individuals in emerging media skills. 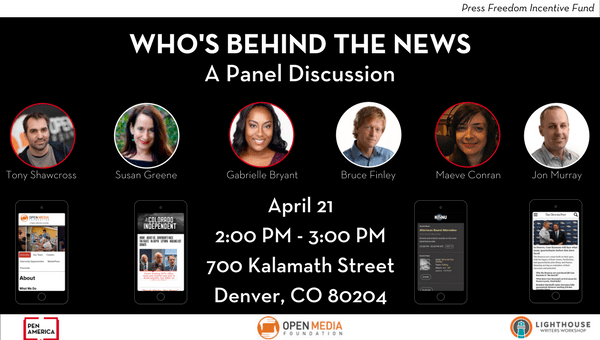 We hope that you were able to join us for the “Newsroom Transparency: Panel Discussion” and closing reception in Denver in support of Colorado Journalism Week.